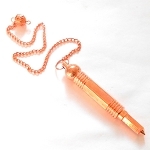 Copper Isis chamber pendulum. 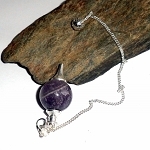 The ball at the top of the pendulum unscrews and opens up a hollow chamber. 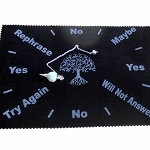 Isis pendulums are useful for reading astrological charts. 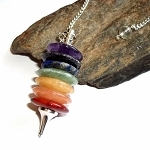 The Isis Pendulum, named after the Egyptian Goddess of Heaven and Earth, symbolizes the Cross of Life. Copper is a metal that's all about channeling energy. It is the metal of the magician, crackling with electricity and fire, a conduit between heaven and earth. 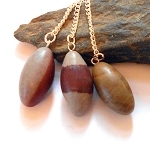 Copper is a strong energy conductor that enhances the energy of any stone with which it is used. 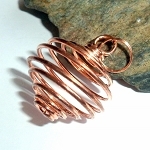 Copper is an earth element material that works with all chakras and its natural patina does not inhibit its energy powers. Copper supports iron in the formation of red blood cells and hemoglobin, and it helps the body heal after accident, injury, or surgery. Total length approximately 10 inches. These are a nice heavy weight design.